An astonishing number of faint low surface brightness dwarf galaxies recently discovered in the Fornax cluster of galaxies may help to solve the long-standing cosmological mystery of “The Missing Satellites”. Computer simulations of the evolution of the matter distribution in the Universe predict that dwarf galaxies should vastly outnumber galaxies like the Milky Way, with hundreds of low mass dwarf galaxies predicted for every Milky Way-like galaxy. The apparent shortage of dwarf galaxies relative to these predictions, “the missing satellites problem,” could imply that the cosmological simulations are wrong or that the predicted dwarf galaxies have simply not yet been discovered. The discovery of numerous faint dwarf galaxies in Fornax suggests that the “missing satellites” are now being found. The discovery, made by an international team of astronomers led by Roberto Muñoz and Thomas Puzia of Pontificia Universidad Católica de Chile, was carried out using the Dark Energy Camera (DECam) on the 4-m Blanco telescope at Cerro Tololo Inter-American Observatory (CTIO). 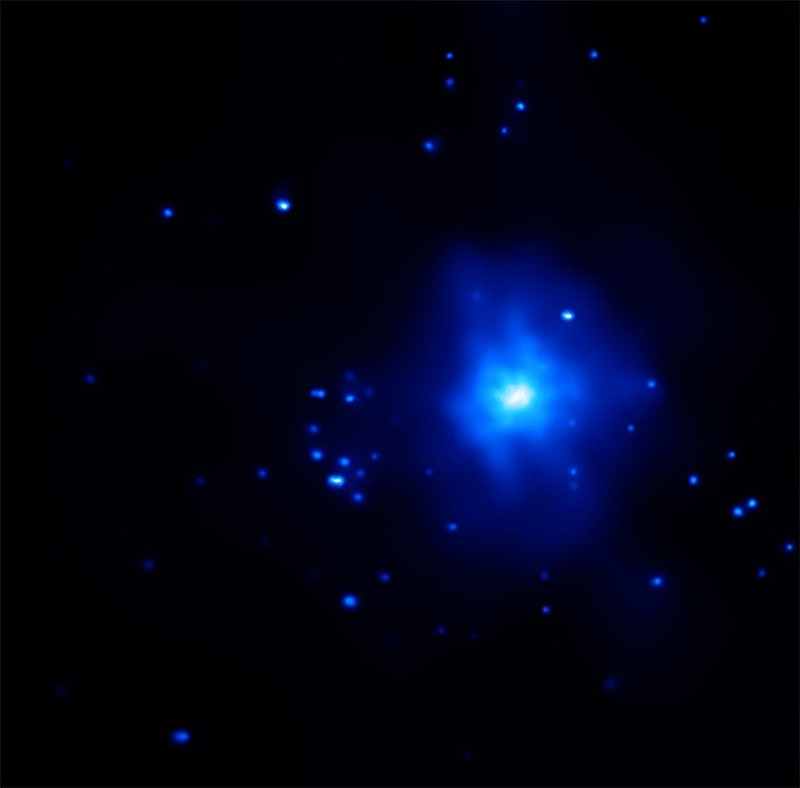 The deep, high-quality images of the Fornax cluster core obtained with DECam were critical to the recovery of the missing dwarf galaxies. “With the combination of DECam’s huge field of view (3 square degrees) and our novel observing strategy and data reduction algorithms, we were able to detect extremely diffuse low-surface brightness galaxies,” explained Muñoz, the lead author of the study. The image at the top of the page shows elliptical galaxy NGC 1399 in the Fornax cluster. The spectrum reveals emission from oxygen and nitrogen but no hydrogen, a rare set of signals from within globular clusters. The physical conditions deduced from the spectra suggest that the gas is orbiting a black hole of at least 1,000 solar masses. Oldest Known Stars in the Cosmos –A "Lonely Hearts" Club?